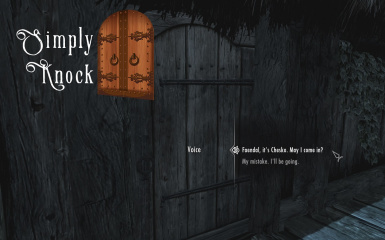 Simply Knock is the first feature-complete mod that allows you to knock on locked doors of houses in Skyrim. * You are not allowed to re-upload this file, in whole or in part, anywhere, for any reason, without the author's written permission, with the exception of free use of the SKSE C++ project / implementation of GetLinkedDoor() as mentioned in the Compatibility section. * You may translate this mod into a language other than English and upload the portions of the mod required for that translation (such as the plug-in file and the MCM Translation text files), without permission; you already have permission. Your translation **must** require that the user download the main, English-version mod in order to work. No stand-alone translations. * If I cannot be reasonably reached via e-mail, Reddit, PM, or Twitter for 6 months, this mod becomes public domain and free for anyone to use and redistribute for any reason. The license for Simply Knock is available on **[Evernote](https://www.evernote.com/shard/s53/sh/b2ff37b7-4d04-433d-b769-238bd7447bc7/ee566b7196e692fcb588a755ee0bfb87)**. * Credit to the SKSE team. * Huge thanks to PurpleLunchBox and Verteiron for helping me create my first SKSE plugin! * Includes portions of PapyrusUtil 3.2. Updated the SkyRe compatibility patch. See Files section. Updated the PerMa compatibility patch. See Files section. Fixed an issue where the "Unlock" option would do nothing when using a controller. Fixed an issue where PerMa / SkyRe were not granting the player Dexterity / Fingersmith skill when picking a lock while sneaking. We now keep the door open a little longer after the player exits a residence before relocking it, in order to give the player's followers a chance to exit. This also greatly reduces the likelihood that an owner will flag the player or a follower for trespassing immediately upon leaving. Added a check to ensure the player was not in a menu when playing the "Hey, beat it!" dialogue after failing a speechcraft check. "Welcome Duration" (how long you can stay once permitted entry) and "Failure Timeout" (how long it takes before you can request entry again after failing) are now separate options. Dogs can no longer answer the door. Better handling of cases (like Chillfurrow Farm) where the door has no owner, but the cell is owned by a single actor. The mod now correctly checks whether or not an actor found in the linked cell is disabled or not. This prevents actors that are disabled until a certain event has occurred (i.e. Calder the House Carl in Hjerim) from answering the door incorrectly. If a cell is owned by a single actor instead of a faction (rare), the mod now correctly checks that the actor owner is alive and enabled. Added SkyRe compatibility patch. See Files section. Added PerMa compatibility patch. See Files section. Removed the "Alternate Door Menu" option. Recent changes to the main door menu made it unnecessary. Added "Use Alternate Door Menu" option to the Config Menu. This will improve compatibility with Address Unknown (menu will no longer show the destination of the door). 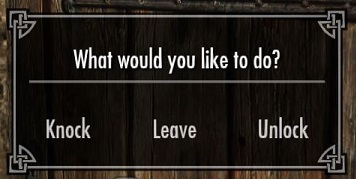 However, this option will be less compatible with other mods that override door activation to add additional choices to the menu; only "Knock", "Leave", and "Unlock" will display when this is enabled. The Knock menu no longer displays when sneaking; you are taken directly to the lock pick screen. Fixed a case where children could answer the door when an adult was home. Fixed a bug where the bribe dialogue option for children was not appearing. Fixed a bug wherein, after being permitted entry into a residence, all of the residence's belongings were flagged as already owned by the player (i.e. nothing could be "stolen", only "taken"). 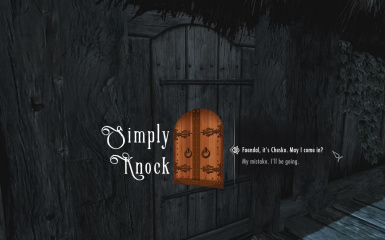 Simply Knock is the first feature-complete mod that allows you to knock on locked doors of houses in Skyrim. If anyone is home, they will answer the door! You can then flex your speechcraft skills in order to get them to allow you inside. If someone inside is a friend, they will always permit you to enter. 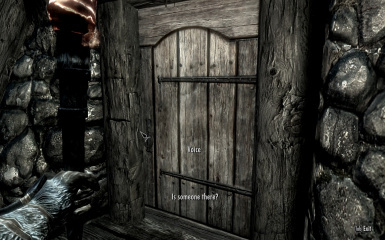 All house doors in Skyrim can be knocked on if locked, as well as some businesses where people live (farms, stores, etc). If you need a quiet place to stay the night, or want to visit someone you know at odd hours, just knock on the door like a normal civilized person. Also useful for checking to see if anyone's home before you commit your next burglary. My goal was to make a very simple, lightweight, no-nonsense mod that had a place in almost everyone's game, regardless of mod tastes or playstyle. Click on any locked residence in Skyrim. 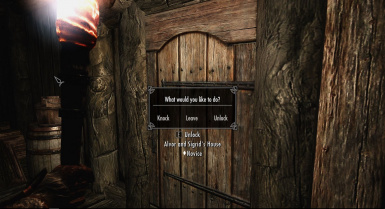 Instead of the lockpicking screen, you will be given the choices of "Knock", "Leave", and "Unlock". If someone is home, they will answer the door. You can talk to them through the door and try to bargain your way in. People that are your friend always allow you to enter (configurable), so being helpful pays off. If no one is home, you will receive the message "No answer." More videos are available in the Videos Tab. Simply Knock is developed on Github. The latest changes are documented on Simply Knock's change log on Evernote. Just install as normal with your mod manager of choice. If conflicts arise due to PapyrusUtil components (JsonUtil, StorageUtil), choose to overwrite those components, and / or load this mod as close to last as you can in your load order (in Mod Organizer, with highest Priority value possible). This is not a source of a conflict; please do not create a bug report about this. * Go to an exterior cell. * Wait 48 hours in-game. I said "enough is enough" and then set about creating this. The voice of the person you hear on the other side of the door will match the person actually answering the door. Yay! If no one is home, or no one is able to answer the door, no one will answer. Simply Knock implements a Mod Config Menu to configure a few minor settings, such as how difficult or easy your speechcraft attempts should be. It also adds Settings Profiles, as seen in some of my other mods. Configure it once, and your settings are ready on your next character or play-through automatically. If allowed inside, the area will remain unlocked and the occupants will be non-hostile to you (will not accuse you of trespassing) for the duration of your stay, or until the next time their "lock up the doors" routine starts (usually the next day). Try not to overstay your welcome. If the occupant refuses to let you in, they will continue to refuse you for 24 hours (configurable). Continued knocking will only cause them to yell at you to go away from the other side of the door. Simply Knock is smart enough to not display the Knock option inside dungeons with locked doors, or in other hostile areas where this option doesn't make sense. It also doesn't display the option when inside and trying to go outside. If you are sneaking, the lock pick screen will always be displayed instead. * Base success chance of requests - The base chance of how often you will succeed in requesting to come inside, unmodified by Speechcraft skill. Speechcraft adds 0.5% chance per point of Speechcraft. Default: 50%. * Welcome duration - How long you can stay in a cell once invited (until you leave). Default: 12 hours. * Failure timeout - How long before you can try to request entry at a given location again after failure. Default: 24 hours. * Friends always allow entry - If enabled, friends will always allow you to enter. Default: Enabled. * Settings Profiles - This mod saves your settings to a profile by default, and are persistent across saves and new games. If you use mods like Campfire or Frostfall 3, you are probably familiar with this feature. Obviously, since this mod implements somewhat complex behavior, this mod requires scripting. However, there are no always-running, background scripts. This mod should not impact you performance at all on an ordinary basis. When you succeed or fail a persuasion/intimidation check, a small invisible marker is placed near the door, which has a small script that stores this data, but otherwise does nothing. 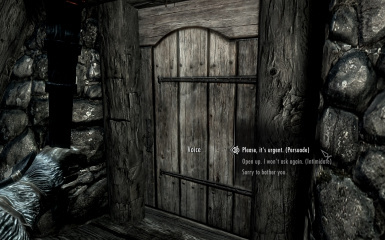 This way the mod can "remember" if you've tried this door already and what the result was. After 24 hours (configurable), the marker deletes itself, so the mod "forgets" the attempt and you can try again. The mod uses one new AI package (applied dynamically) to keep the person that answered the door awake and out of bed for the duration of your visit. The person who answered will revert back to normal behavior as soon as you leave, almost always locking the door behind you. Why hasn't a mod like this been made already? A few have, but up until now they've all had some critical shortcomings. What makes this mod unique is that it solves a difficult problem: discovering what cell a door leads to. Weird as it sounds, there is no default Papyrus function for getting the destination of a door. 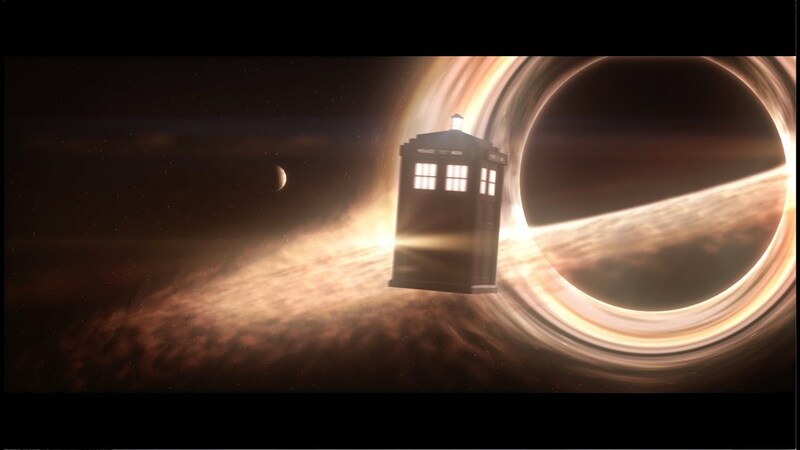 From a script's perspective, stepping through a door in Skyrim is a lot like stepping through a wormhole; you don't know where you'll end up or what's inside. Because of this, it was impossible to discover important things like "Where does this door go? ", "Who owns this door?" and "Are the owners home? ", before you actually go through the door. 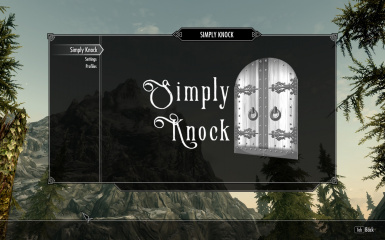 Simply Knock implements a custom SKSE function GetLinkedDoor() that sidesteps this problem and provides this missing piece of information to make the rest of this mod possible. If you would like to use Simply Knock's SKSE implementation of GetLinkedDoor(), feel free to use any of the code found in simplyknock_skse_plugin when creating your own SKSE plug-in. It is free for anyone to use.  * No Psychic Lock Knowledge - The door menu does not betray the difficulty of the lock. * Address Unknown - The door menu does not betray the destination of the door. * SkyRe - Requires compatibility patch. See Files section. * PerMa - Requires compatibility patch. See Files section. * Using Simply Knock, SkyRe, and Lock Overhaul simultaneously, with Lock Overhaul's "Auto Pick" feature will cause the door menu to display an "Open" option, which will effectively do nothing. Also, selecting "Auto Pick" may bring up the lock picking screen occasionally, especially when sneaking. Canceling out of the lockpicking menu after auto-picking will show that the door was unlocked successfully. All other features of Lock Overhaul should function normally. These (minor) issues are not present when using Simply Knock and Lock Overhaul WITHOUT SkyRe. * Includes StorageUtil.dll and JsonUtil.pex/psc from PapyrusUtil 3.2. This mod can run along-side other mods that implement PapyrusUtil and also include these files. It is recommended that you load this mod last / later than (in Mod Organizer, with a higher Priority) other mods that implement PapyrusUtil. * Simply Knock attempts to match the voice type of the occupant with a list of known common voice types. This will catch 90%+ of possible cases in the game. If the voice type of the occupant is unique, the system defaults to using MaleEvenToned or FemaleEvenToned and the speaker is named "Indistinct Voice" instead of "Voice". This just means that the person you hear on the other side of the door might not match what they actually sound like in this case. * This mod is designed around knocking on locked doors that lead to another interior cell. This, again, catches 90%+ (if not 100%) of the cases in the vanilla game. If you are using a mod that brings the interiors of buildings into the Tamriel (or other outdoor) worldspace, or a mod that adds new houses / building that have their interiors in the same cell as the exterior, this mod will not function in those instances, and the author has no intention of supporting such a case. 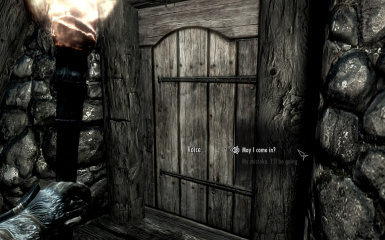 * This mod uses a perk (not one you select, but internally to the mod) in order to override the activation of doors. In general, this is compatible with other mods that also use a perk to override door activation. Please note any incompatibilities you run across. * Other than those specific cases above, should be compatible with everything. * I want to report a bug. What should I include in my bug report? If you observe unwanted behavior, I need the following information. Failure to include this information means you will probably receive no assistance. * I left a house, and the door didn't re-lock behind me. There can be several causes of this. One, if the owners of that cell are scheduled to be home and have the doors unlocked at the time you left. Two, sometimes the owner's AI packages don't re-run immediately. Finally, not every cell (such as Chillfurrow Farm) has an owner lock list, and once it's been unlocked, it will stay that way forever. * Some files appeared in my Mod Organizer Overwrite directory. What are they, and do I need them? These are your Settings Profile files. They should be named "common.json" and "profile*.json" under SKSE/SimplyKnockData. If you delete them, you will lose your configuration settings. You can elect to move these into a "new mod" in Mod Organizer and the settings will begin saving there instead. Or, you can leave them in your Overwrite directory and should not encounter a problem if you do. * I see Simply Knock includes PapyrusUtil. I have other mods that also include PapyrusUtil. Is that bad? Shouldn't you make PapyrusUtil an external download requirement? Will I have to play load-order games to get things to work? PapyrusUtil is a modder's resource and is free to be included with a mod. For ease of use for most users, Simply Knock will include the latest version of PapyrusUtil. However, even if you load a mod that includes an outdated PapyrusUtil after Simply Knock, Simply Knock should continue to function correctly. In short: just load Simply Knock as low (high-priority in MO's left pane) as you can, overwrite the components (StorageUtil.dll, JsonUtil) that your mod manager might complain about during install, and forget about the rest. It should just work. If you are that concerned about whether or not you have the latest PapyrusUtil, download PapyrusUtil separately as its own mod and load it at the very end of your load order. You will then always have that version loaded and you can update it independently of any mod that includes it. To quote Captain Planet: the power is yours. * Does this mod use scripts? * Is this mod "script heavy"? Will it impact my performance? 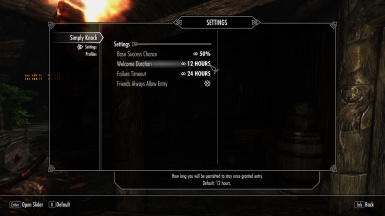 * Does this mod use any always-on, frequently-running background scripts? * Is it compatible with (insert mod here)? It is very, very likely that it is. See Compatibility section for details. * Has this mod been cleaned with TES5Edit? * How is this mod different from "Knock Knock"? There are many differences. Primarily: Simply Knock can determine if the owners are home, while Knock Knock does not. See "How It's Different", above. * Does this mod include an MCM translated into my language? A machine translation of the MCM is included with the mod for your convenience for all languages that SkyUI supports, to ensure that the widest number of non-English users can more-or-less navigate the mod's options. A real translation is most likely desirable; reach out to your favorite translator, or feel free to translate it yourself. * Can I ding dong dash? Nice one, chucklehead. But seriously, I thought about it, but I had a rather aggressive development timeline for the release (5 days) and it simply wasn't important enough. It also has a high likelihood of leading to unwanted behavior. * You may translate this mod into a language other than English and upload the portions of the mod required for that translation (such as the plug-in file and the MCM Translation text files), without permission; you already have permission. Your translation must require that the user download the main, English-version mod in order to work. No stand-alone translations. The license for Simply Knock is available on Evernote.